We started with a question. “What cocktails do they make most at the World’s 50 Best Bars?” This is not easy to answer – we’re talking about thousands of drinks varying in style and constitution. Creativity is central to these bars’ attraction but there are also classics cocktails that unite them – from North and South America to Europe, Asia, the Middle East, Africa and Australasia – age-old recipes are recreated time and again. Sometimes because customers ask for them, but mostly because these are the drinks that occupy a hallowed place in the hearts of the global bartending community. In this year’s Cocktail Trends Report we thought we’d create a list of these favourites, to find out which are in and which are out of fashion right now. Talking to the bartending community, it’s clear the Old Fashioned is anything but and that the Mojito is a fading force – but we wanted proof, not anecdotes. We asked The World’s 50 Best Bars (plus a sprinkling of those that finished not far out of the top 50 in our 2014 poll) to name their top 10 best selling classics. When you look at the hundreds of classics out there, a list of the top 50 seemed a good place to start - frankly we were never going to make a list of any other number. Some of these drinks adhere to the original recipe, others will be twisted, but we take the view that if it is sold as a Manhattan, it is a Manhattan. Giving each vote an incremental ranking from 1-10, we created The World’s 50 Best Selling Cocktails list. Appearing from out of the mist is the boozy brain-scrambler, the Fog Cutter. With white rum, cognac and gin all in attendance, this is one of the most deadly fruit drinks to emerge from the beach bar. Just in case the three measures of spirits weren’t enough, there’s sherry in there too. The bitterness is provided by the lemon, the sweetness by the orange juice and the almond syrup, the cloudy head by their sum total. The 1980s was a dodgy period for music, hair and most definitely the cocktail. The Long Island Iced Tea is a symbol of this dark age and the antithesis of today’s cocktail movement. What it’s doing in this list is anyone’s guess. White rum, gin, vodka, tequila and triple sec are not meant to share a home, but with cola, citrus and sugar, somehow in 2015 they still do. The customer is always right – except this one. 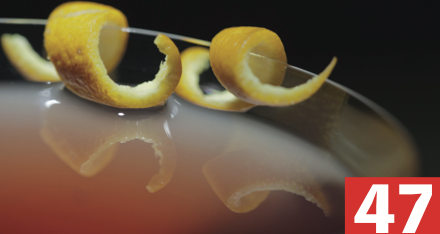 At number 48 is The Bloodhound, a dry gin drink that is more sophisticated than it looks. The red comes from the raspberries (you can try strawberries too), the martini rosso and the marashino, leaving this drink little choice but to be blood red. London dry gin and extra dry vermouth balance what might have been a blushingly sweet drink. A couple of shots of bourbon, grenadine and grapefruit shaken and poured into a coupette and within a blink of an eye you have a Blinker. It’s a classic three-piece cocktail that, until recently, was lost to time. First credited to Patrick Gavin Duffy’s 1934 The Official Mixer’s Manual, it re-emerged when Ted Haigh wrote Vintage Spirits & Forgotten Cocktails in 2004, though he subbed grenadine for raspberry syrup, which many think is an improvement. We expected Planter’s Punch to have been higher in our list. Only 4% of our polled bars put it among their top sellers, despite punch-style drinks enjoying recent renaissance. This one has connections with Planter’s Hotel in Charleston but the recipe is Jamaican. Founder of Myers’ rum, Fred Myers, printed the recipe for the Old Plantation Formula on the back of bottles. Jamaican pot still whisky gives this fruity cocktail some teeth. The Raffles Hotel in Singapore is the place to drink the Singapore Sling, but only if you are in the area and stuck for something to do. Even then, we’d recommend you head to 28 Hongkong Street for a properly made drink. At Raffles they have thankfully dispensed with the premixed version, but there are still question marks over the recipe. As Simon Difford discusses, the official fruit-forward recipe was published in the 1970s – a time when fruity drinks were in fashion – whereas other earlier accounts of the drink omit the pineapple and grenadine and just have cherry liqueur, gin, triple sec, citrus and bitters. From the imagination of Victor Bergeron of Trader Vic’s, this rum and cognac concoction finds a home for orange and lemon juice and orgeat syrup. Best with crushed ice, an orange slice and mint garnish, this tiki classic has more balance than some of its tiki counterparts. Most recipes warn this drink packs a punch, but we can’t resist saying there’s a sting to its tail. The Hurricane hasn’t exactly taken the world by storm, yet remains a favourite in New Orleans, where it is credited to Pat O’Brien, a 1960s tavern owner. It’s a fruity (passion fruit and lemon juice) and rummy (try dark, light and over-proof) libation, perfect for those who like approachable boozy drinks. In New Orleans, especially around Tales season, you’ll find it served in plastic cups, so patrons are able to drink while staggering between bars. It is better served in a glass - if only there was one of appropriate name. After the Sazerac and brandy julep, the Sidecar is the third best selling brandy cocktail at the World’s 50 Best Bars. As a well-worn classic, we might have expected it to feature at the other end of the list, but the Sidecar isn’t driving cocktail trends right now. This brandy, triple sec and lemon drink is essentially a sour but can be sweetened to taste. It has Parisian roots but the original creator has never come forward – or at least not singularly. One of the Manhattan derivatives, Brooklyn will always play little borough to the might of the first born. Instead of sweet vermouth, it requires dry, with the sugary fix coming from maraschino liqueur. Rye provides the pepper and Amer Picon the bitter. After a period of near extinction, its revival has timed nicely with the renewal of its namesake borough, which is now arguably (though not emphatically) cooler than Manhattan.